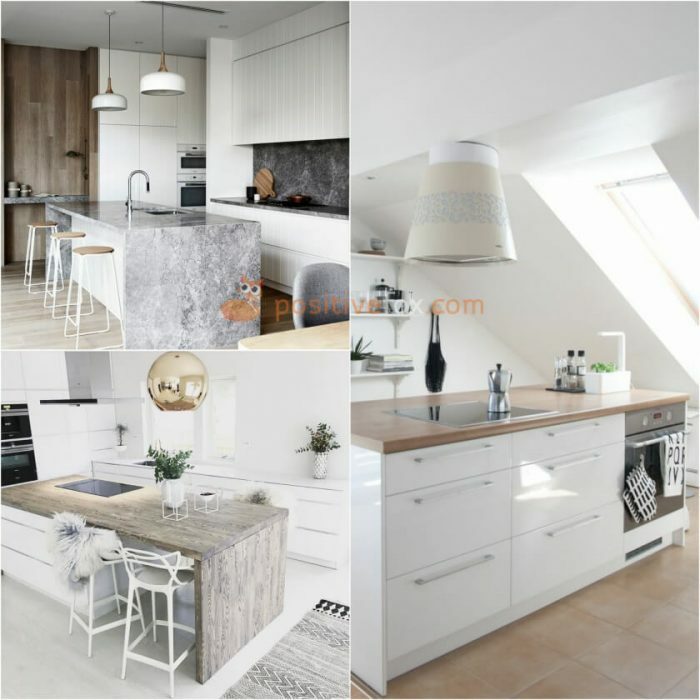 A sink or a stove can be installed in the counter while the island can also be used to house storage solutions for utensils, kitchen accessories and household appliances such as a microwave, an oven, a dishwasher or a wine cooler. 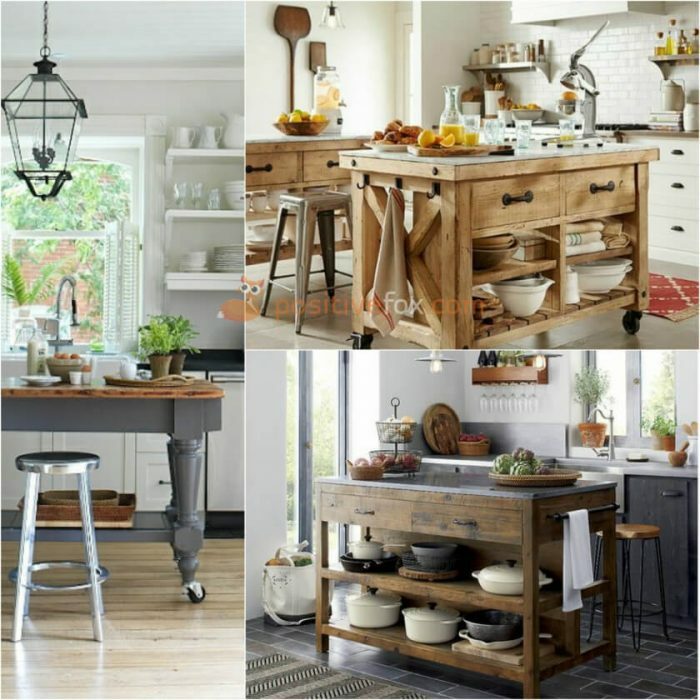 A kitchen island should embody functionality, comfort and compactness. 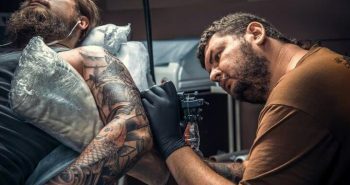 Everything you may need, must be within arm’s reach. 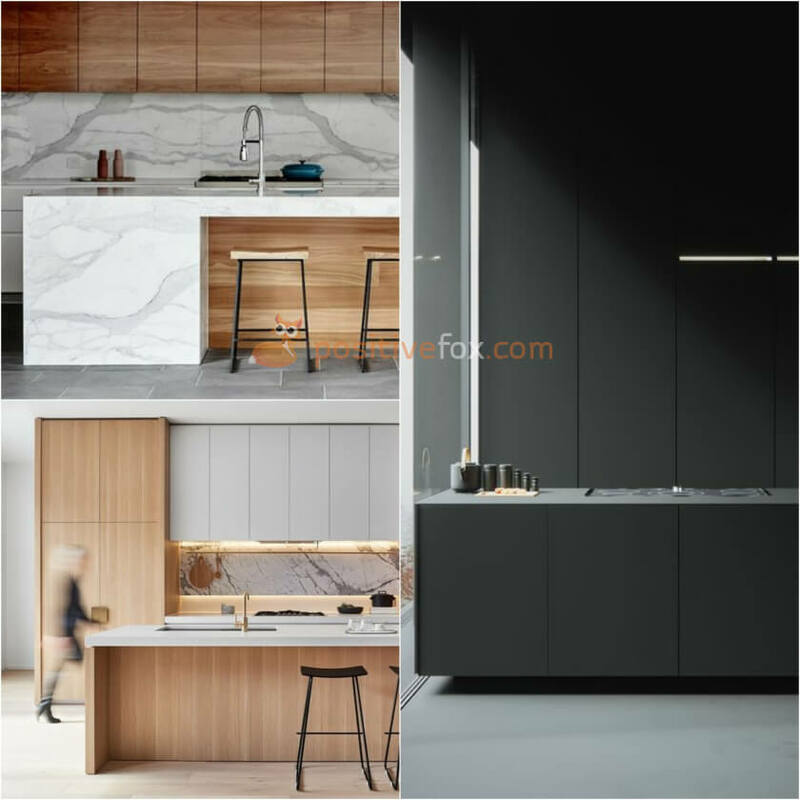 The standard dimensions of this built-in piece of furniture are: height: 900 mm, width: over 1,000 mm, length: 600 mm to 1,500 mm. 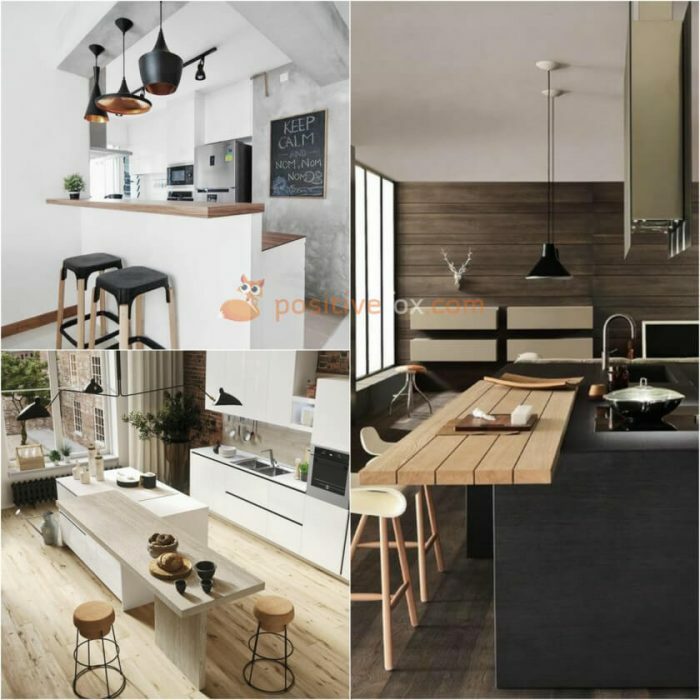 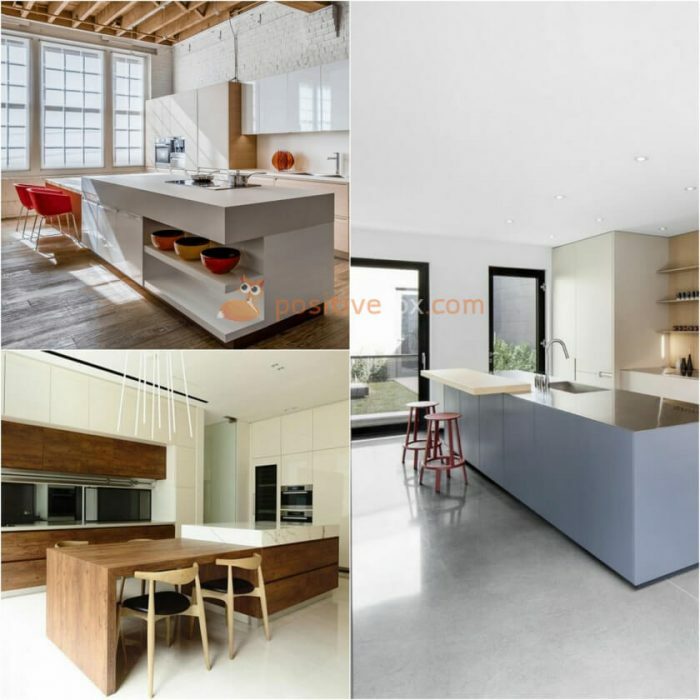 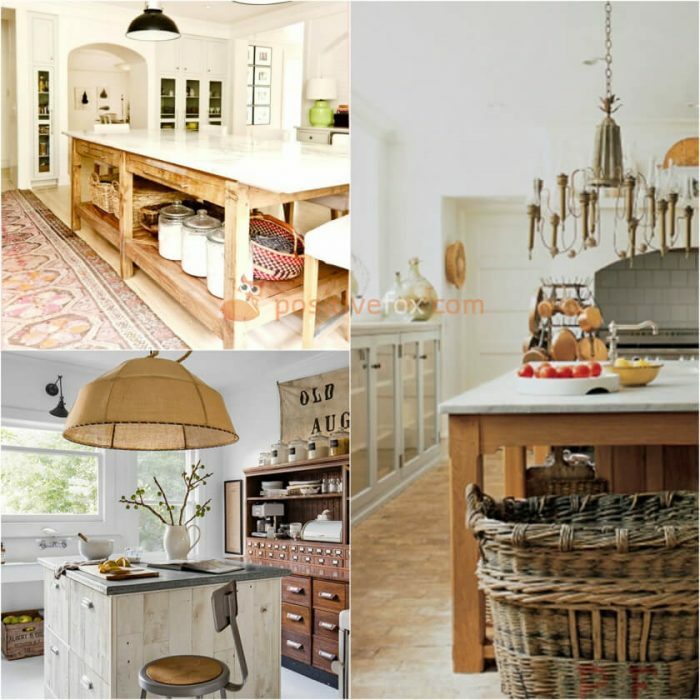 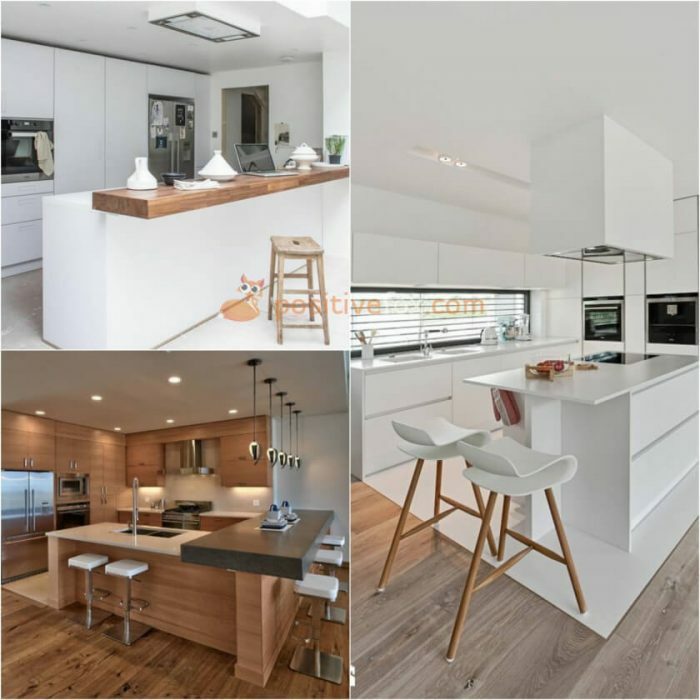 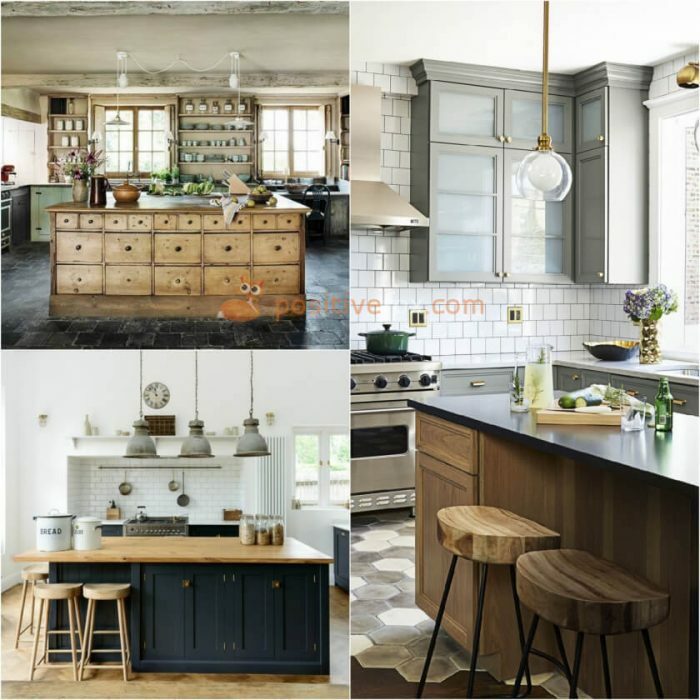 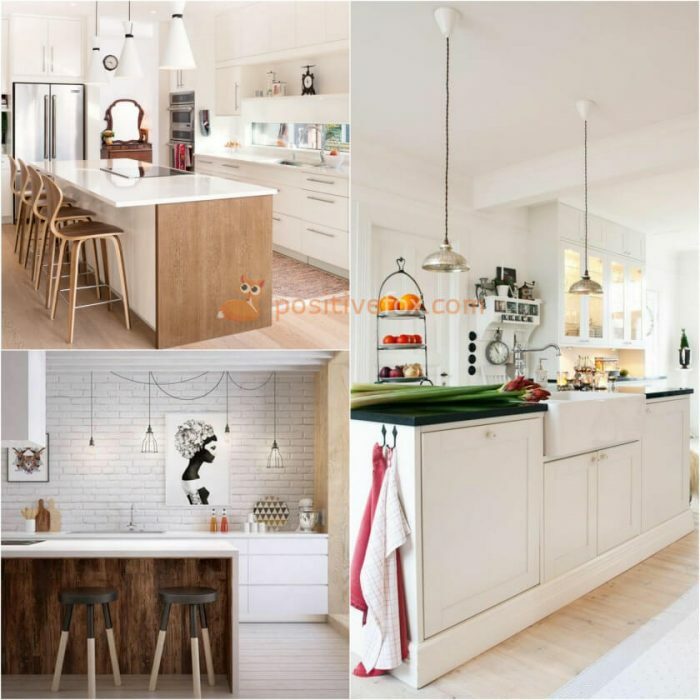 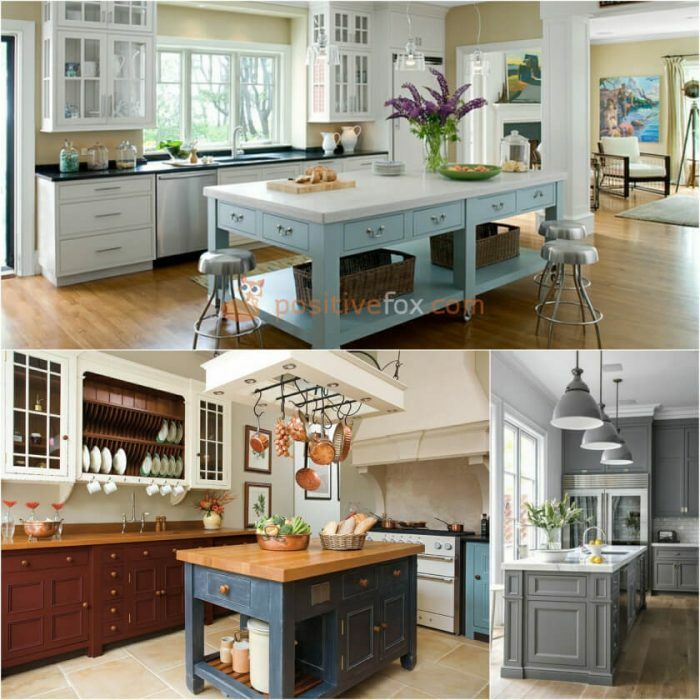 A small kitchen island or peninsula can be installed in any kitchen measuring 15-25 square meters. 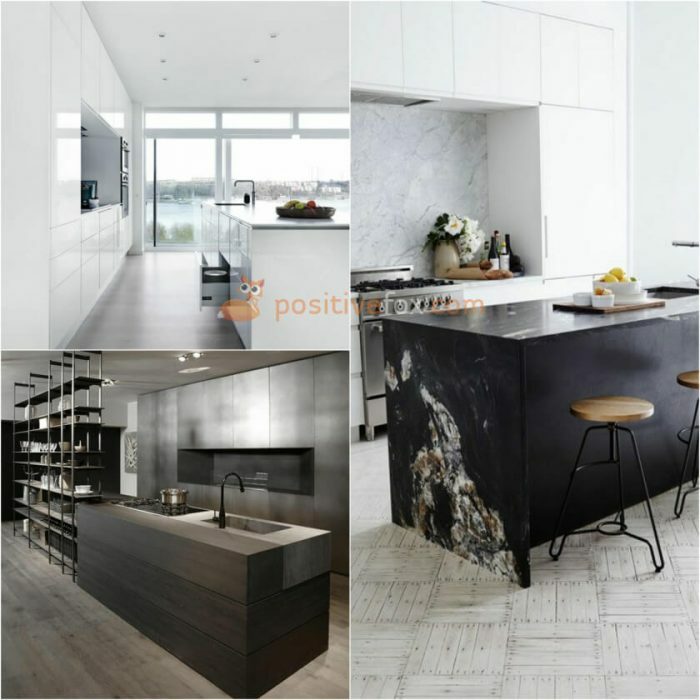 It is important to ensure that the passages between the island and the rest of the furniture should be a minimum of 1 meter wide. 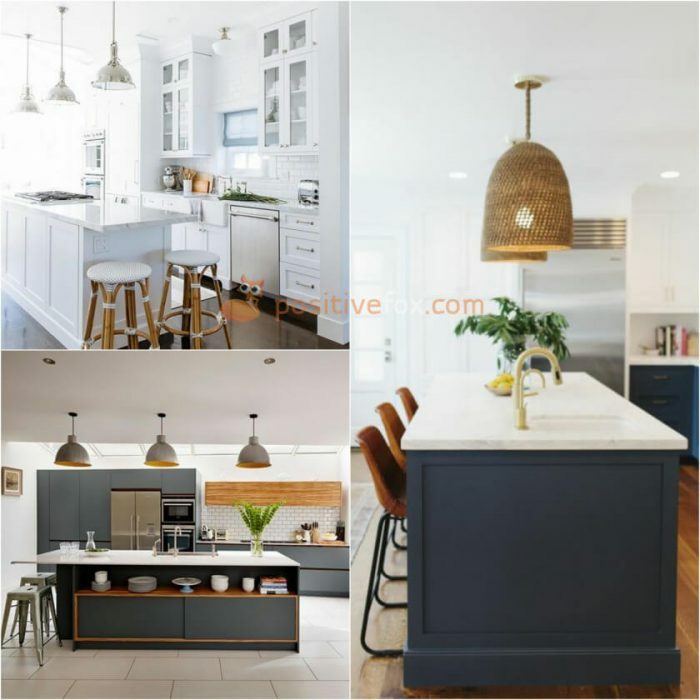 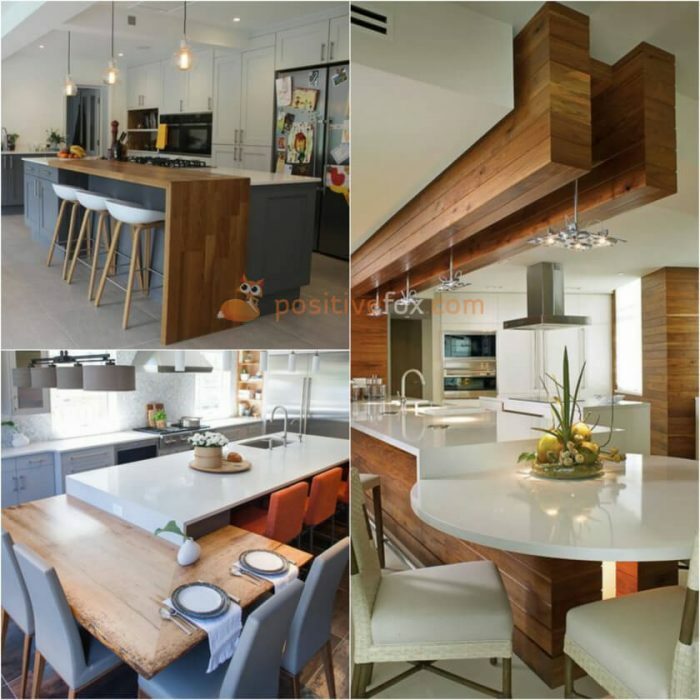 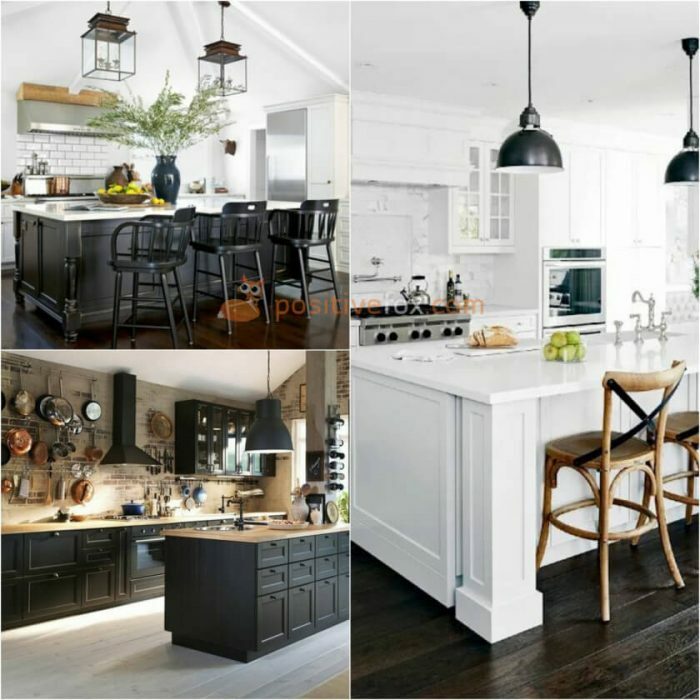 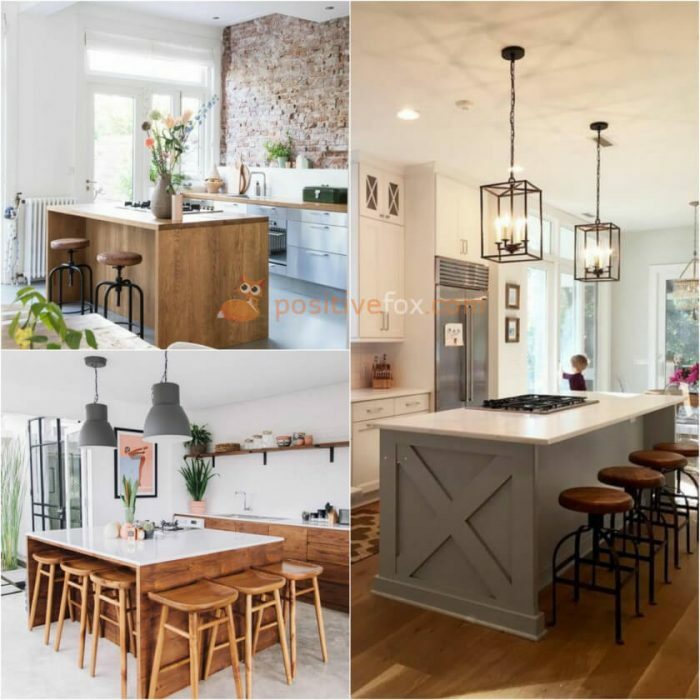 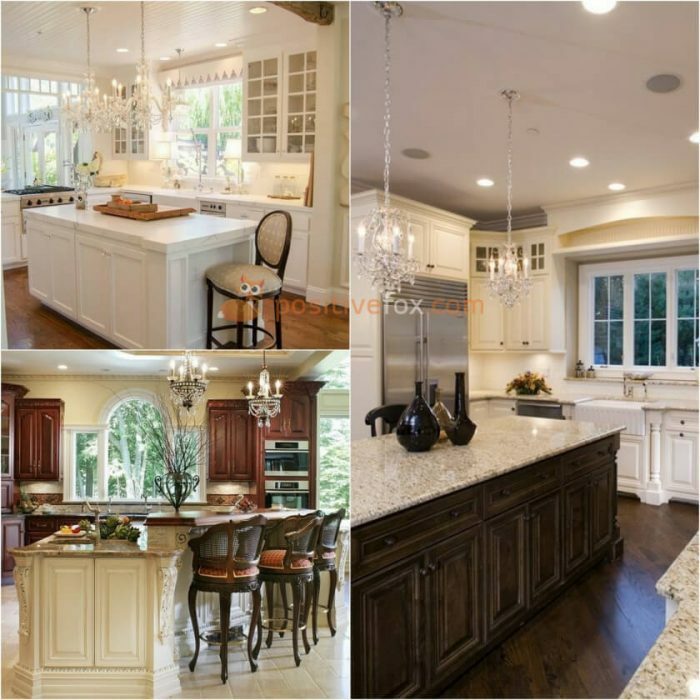 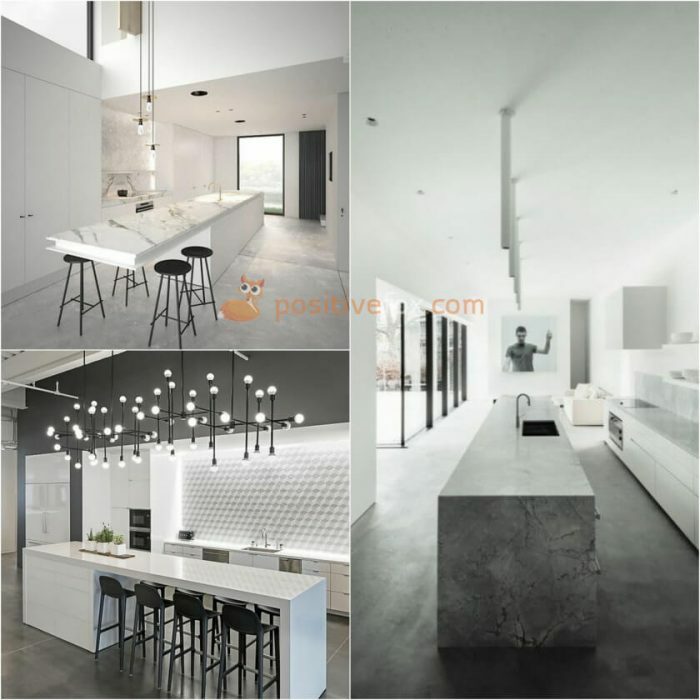 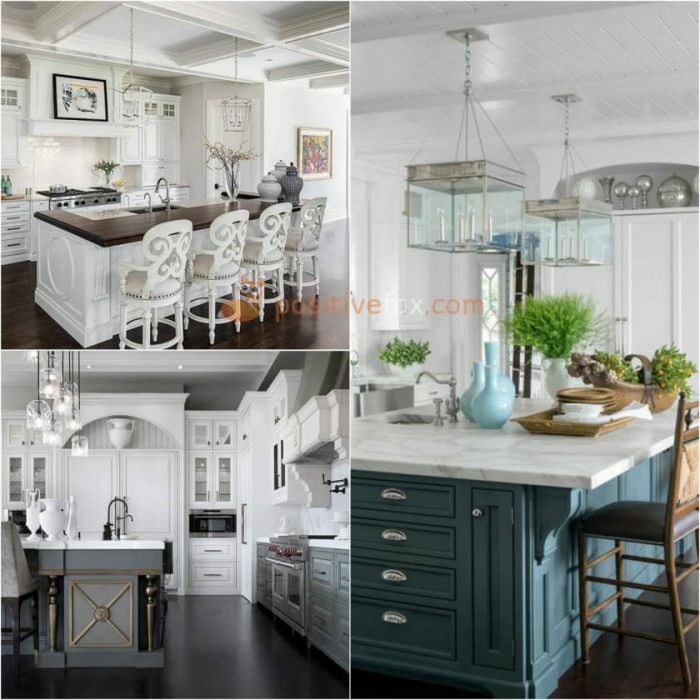 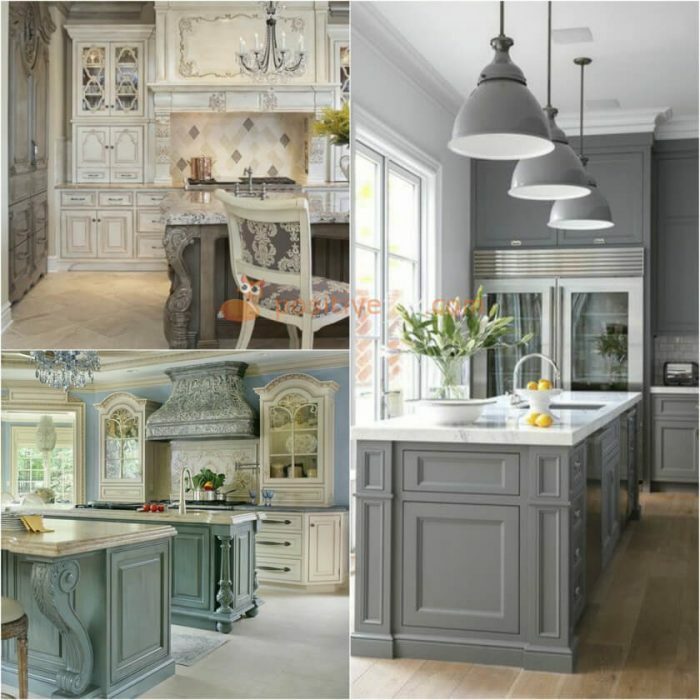 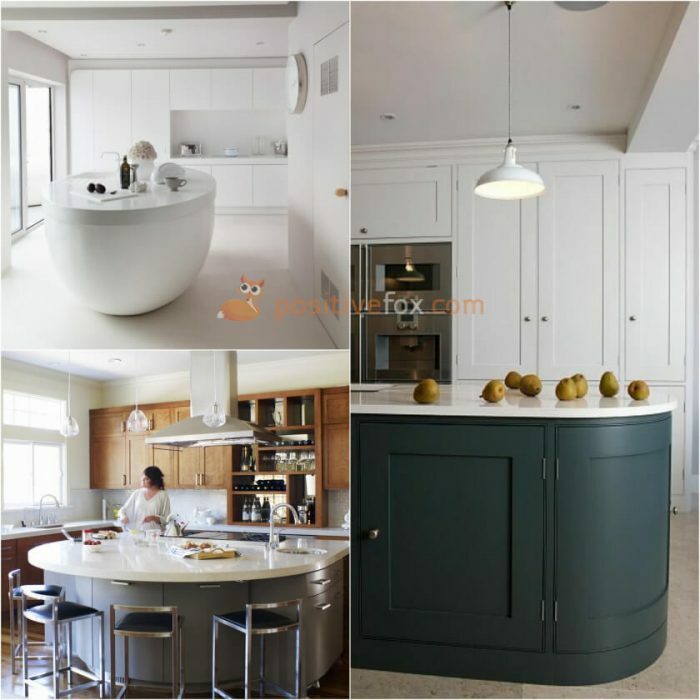 In the interior of a large kitchen, a kitchen island can look elegant and monumental, even though the design of the island can vary in shape, size, color and style. 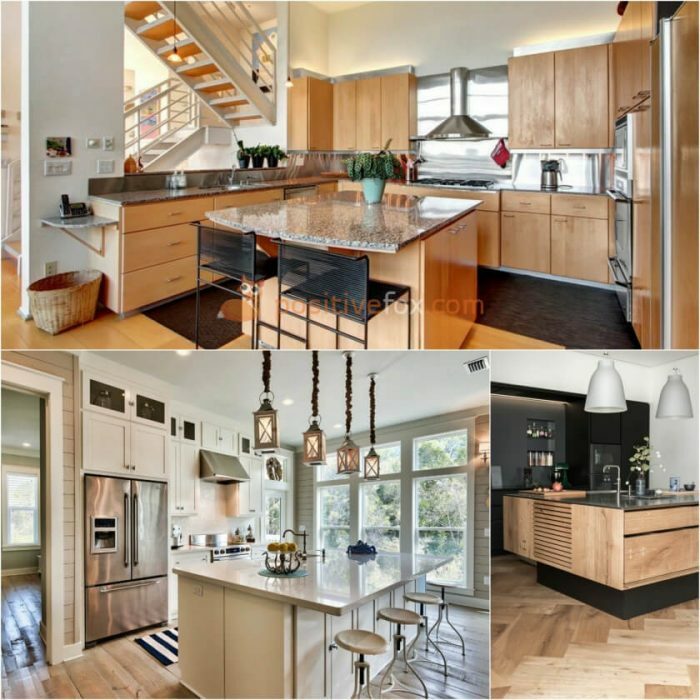 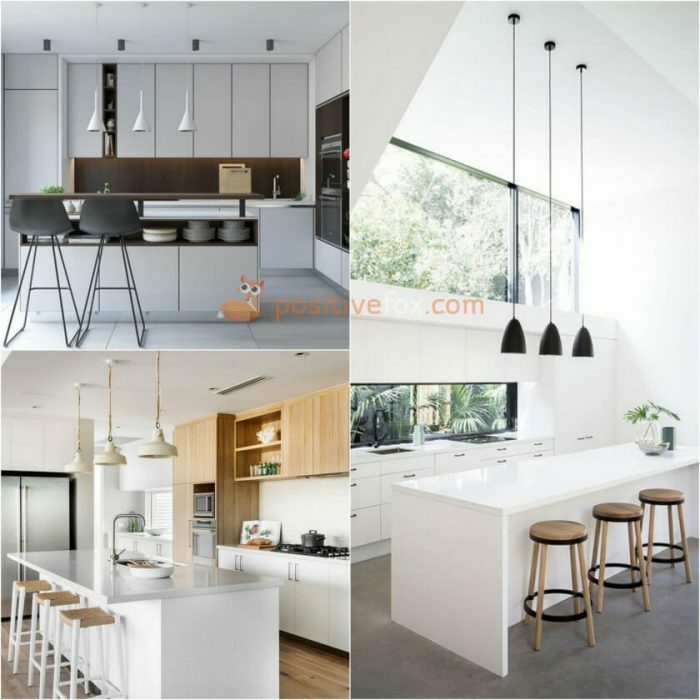 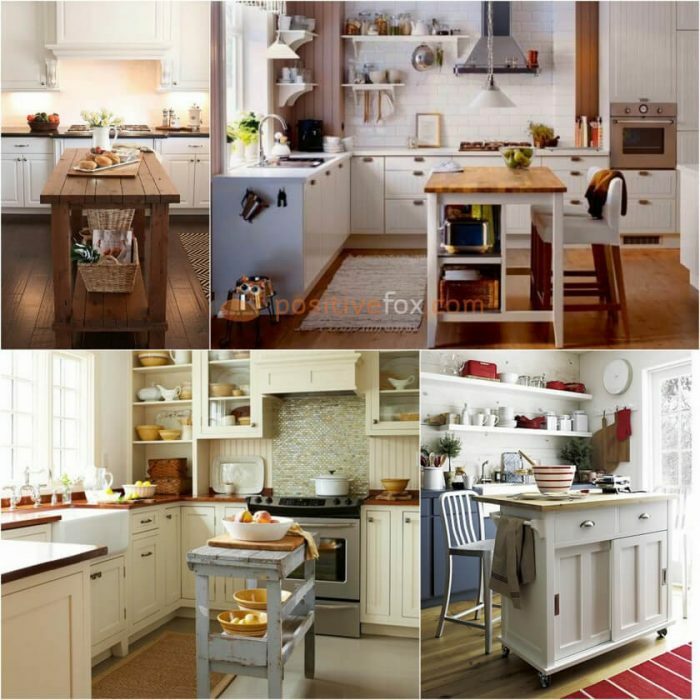 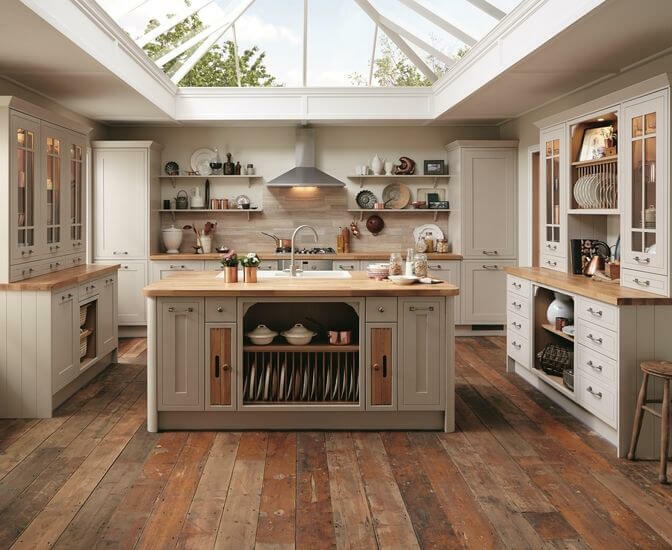 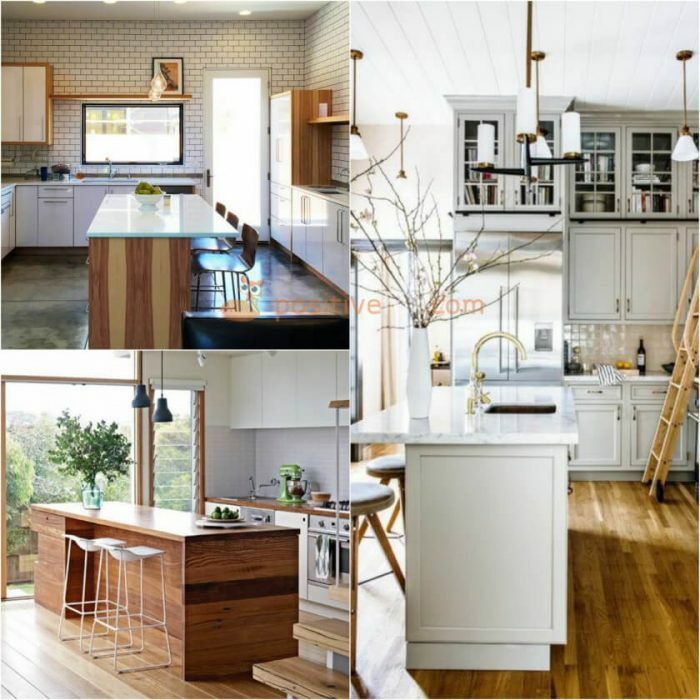 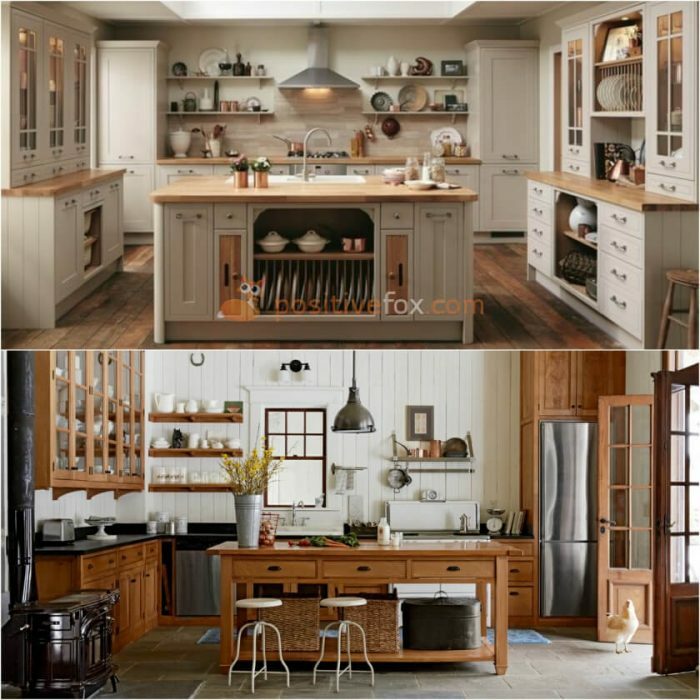 Even if your kitchen is not so spacious, you can choose narrower and smaller options. 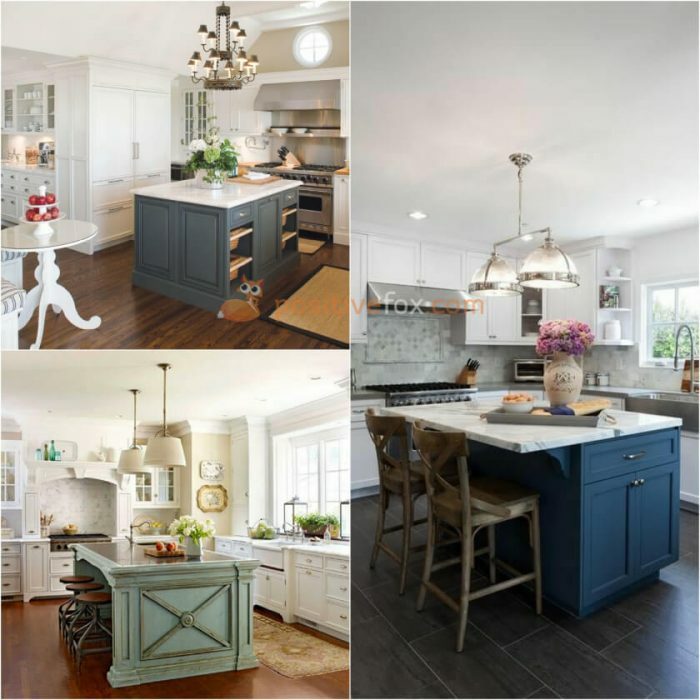 A “rectangle” is the most traditional and common shape of a kitchen island as it tends to fit perfectly into small, elongated spaces. 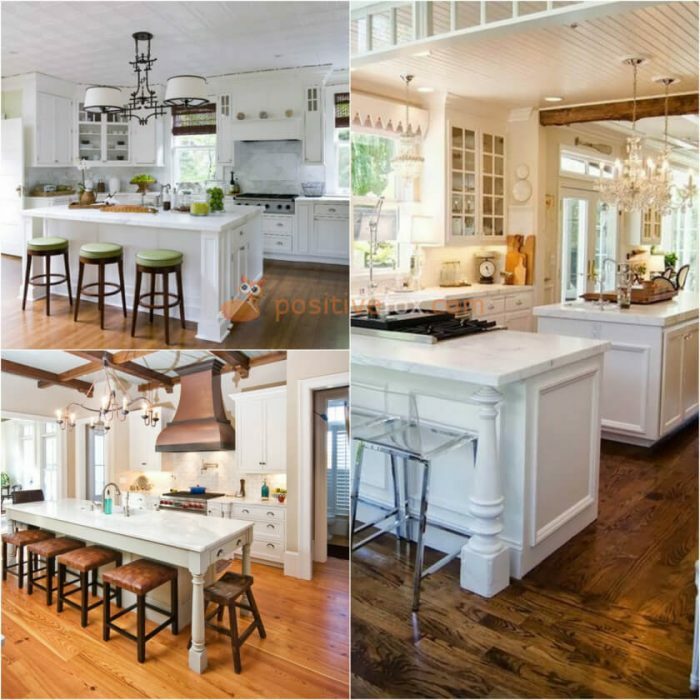 A square island can be placed in kitchens which are square-shaped themselves, or if the rest of the kitchen has a U-shaped layout. 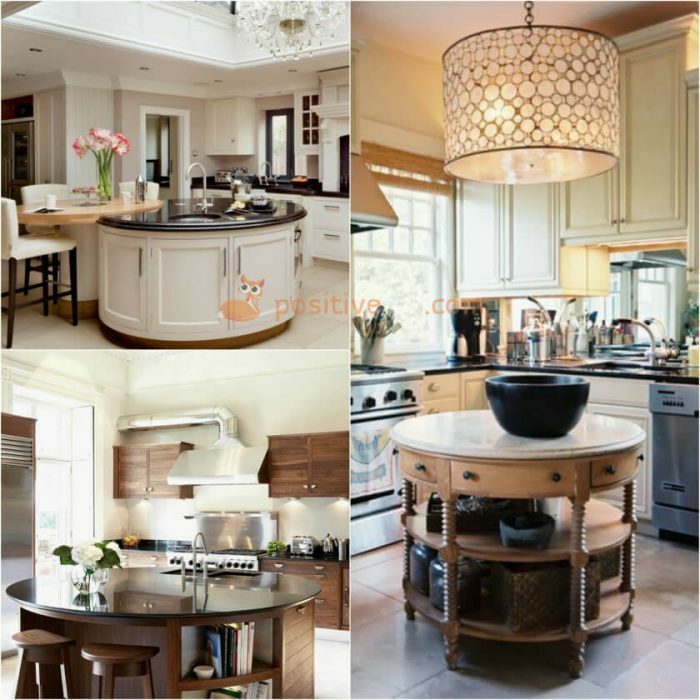 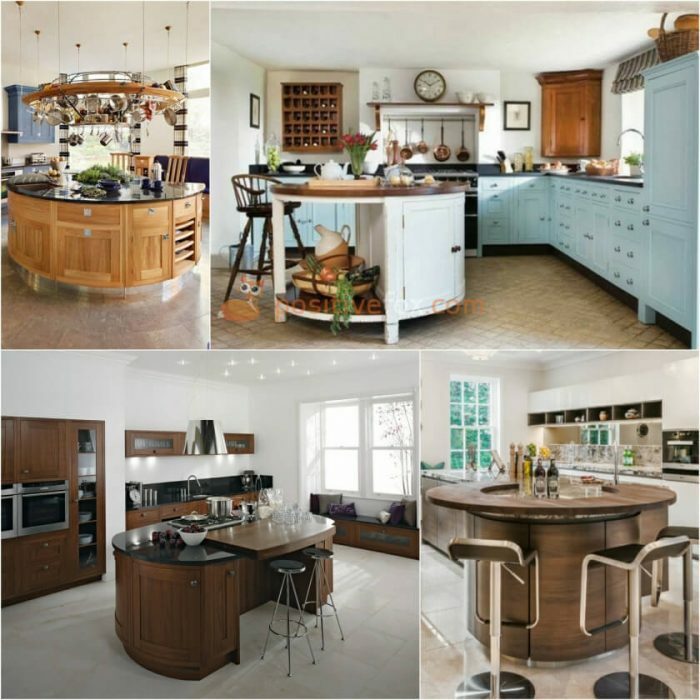 Semi-circular, completely round and oval kitchen islands are excellent for an island with a bar counter. 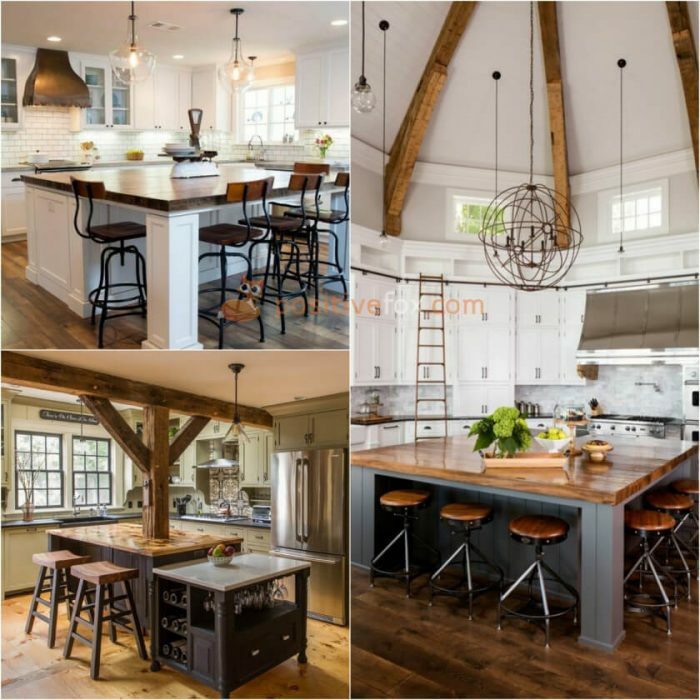 A multi-leveled kitchen island with a bar counter will separate the kitchen space. 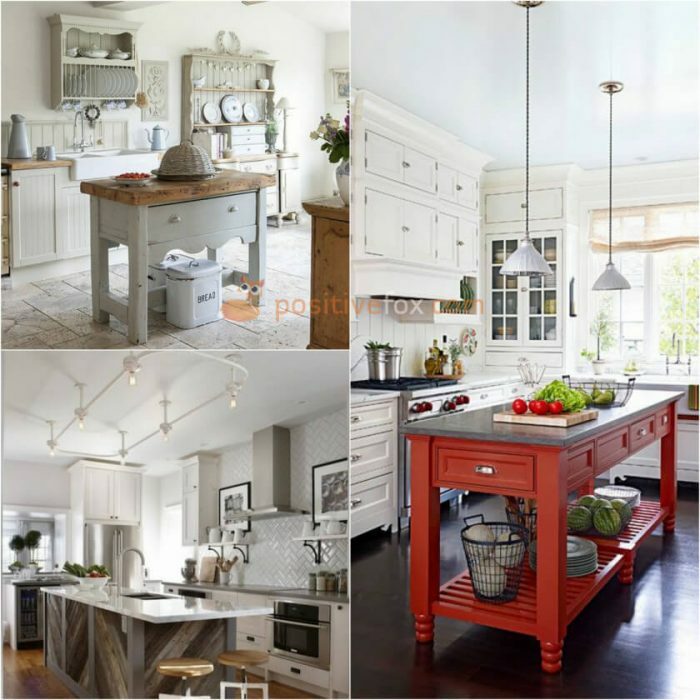 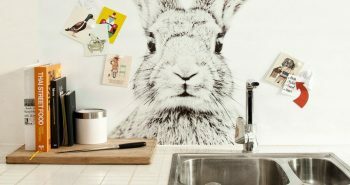 There is no limit to creativity when it comes to kitchen island design. 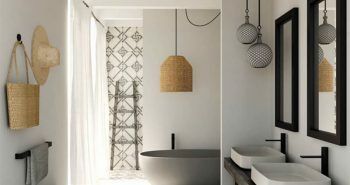 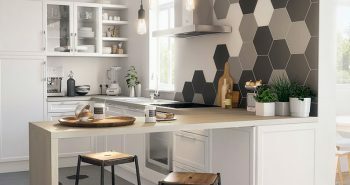 The shape of the island can also be unconventional – from zigzag to hexagonal. 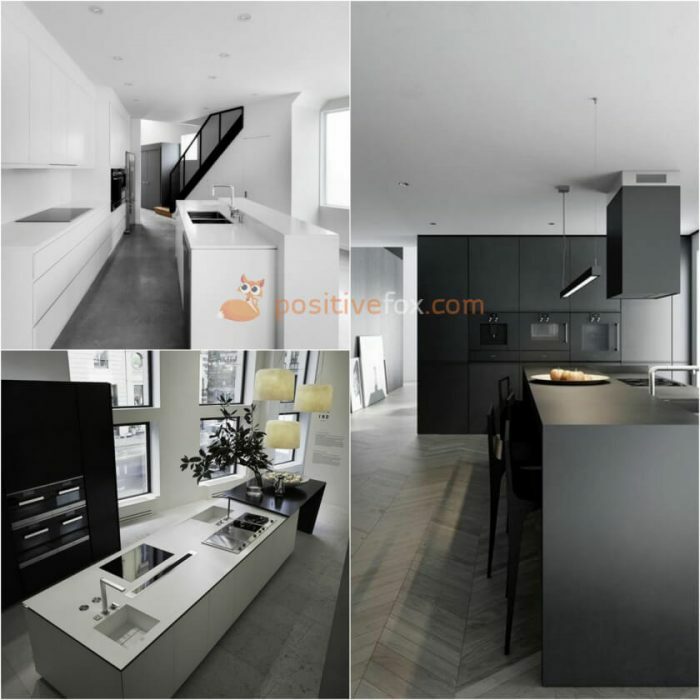 But the height should remain approximately the same: 900 – 920 mm. 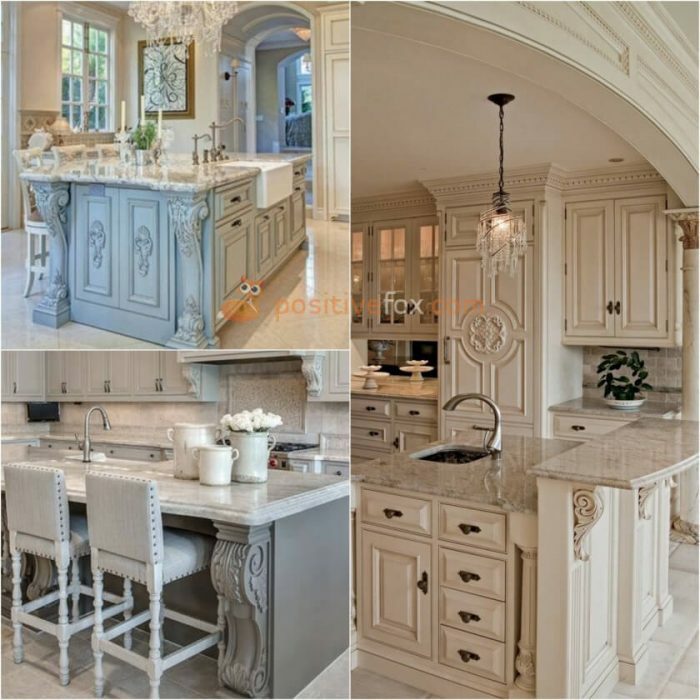 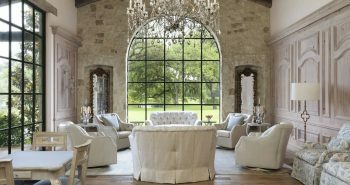 Classic design – incorporate stained glass windows in the kitchen island doors, carved elements, stone countertops, arched open shelves with attractive balusters. 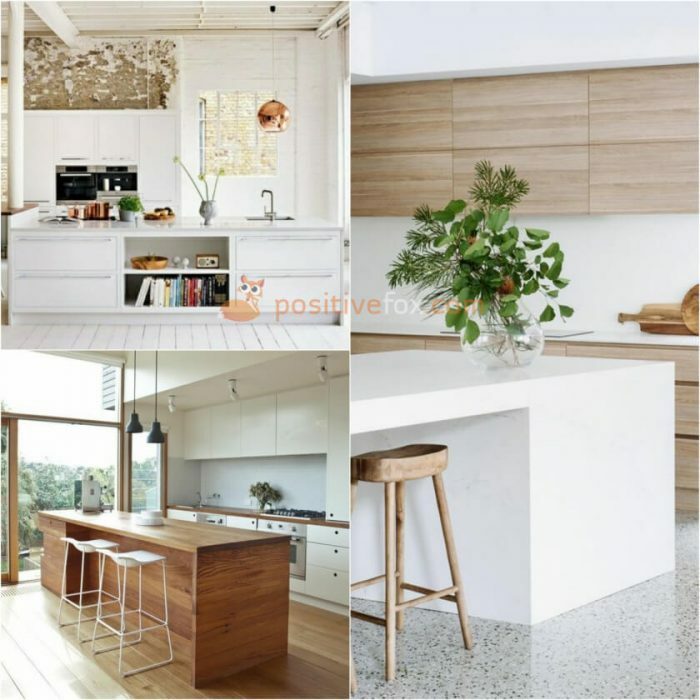 All of the materials should be natural. 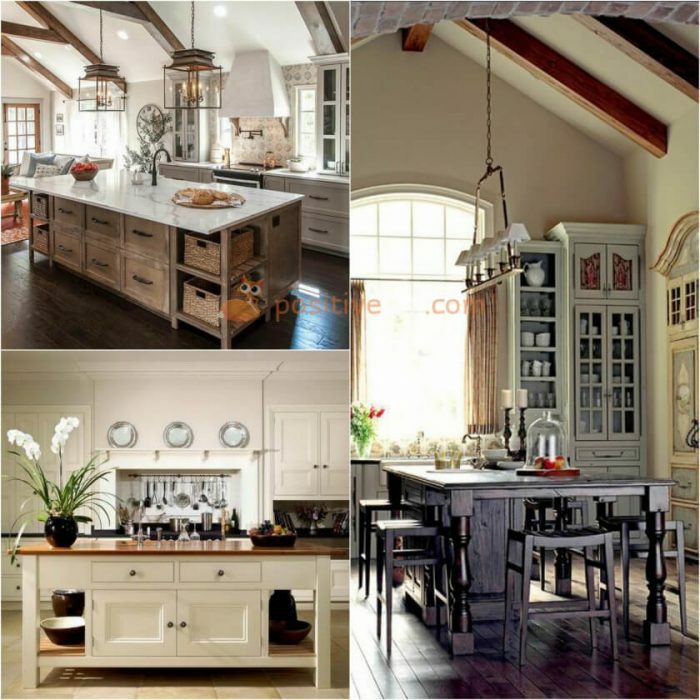 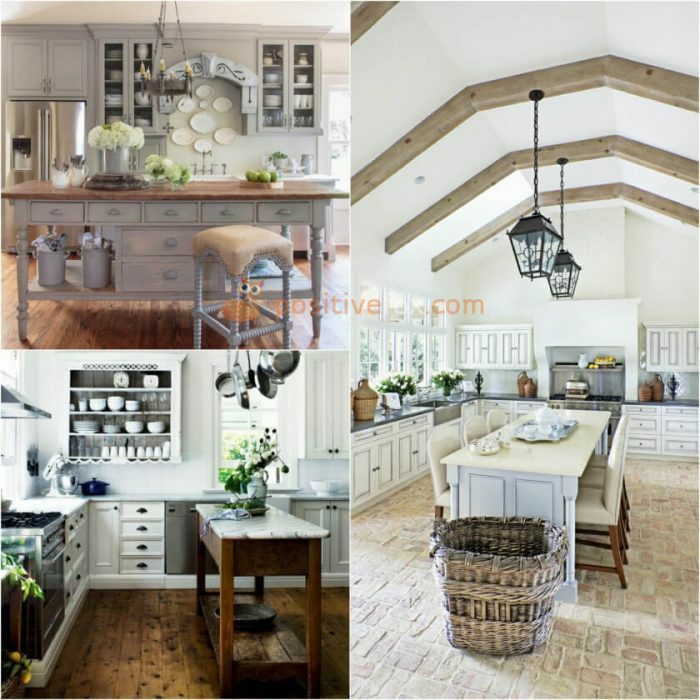 Country design – the distinct features of country kitchen island are the open wooden countertop, delightful calico curtains and wicker baskets instead of boxes for storage. 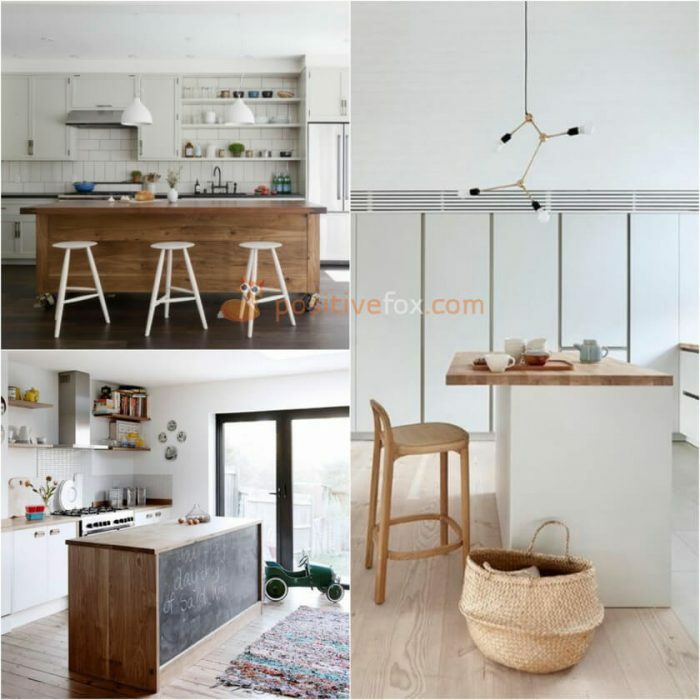 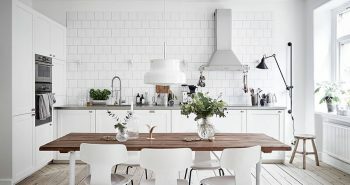 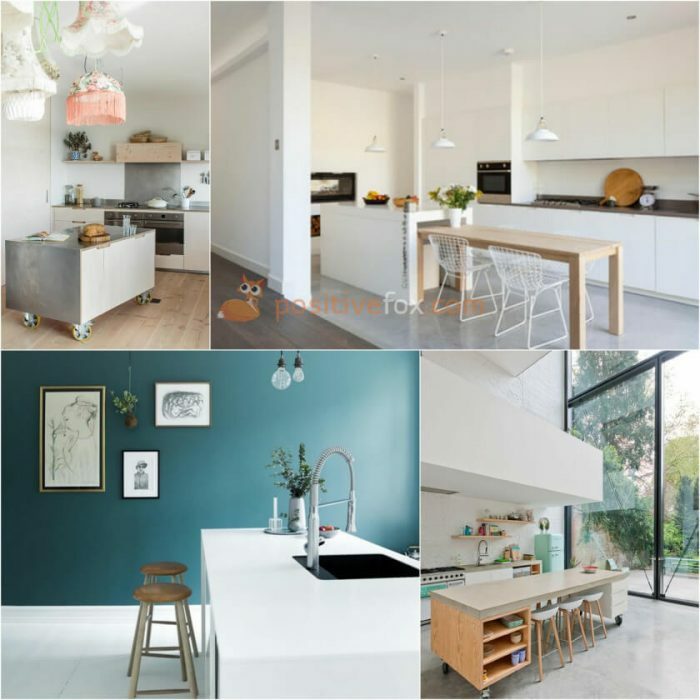 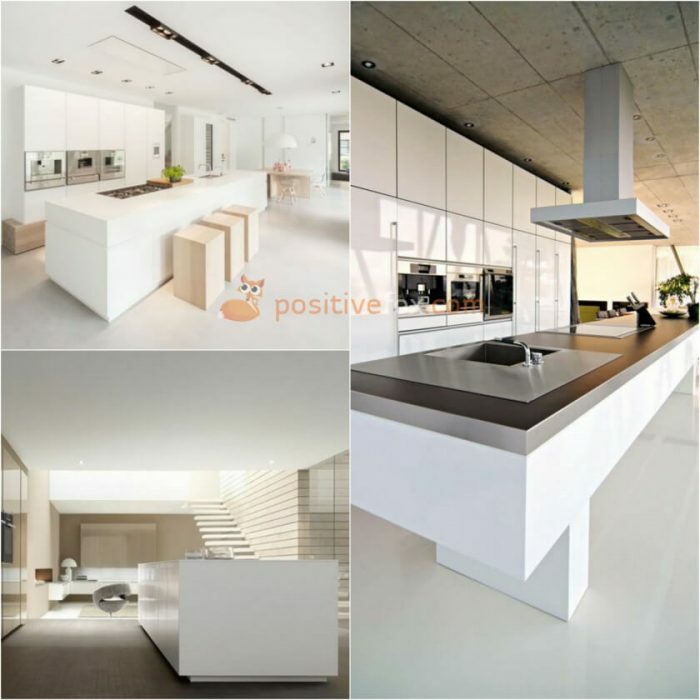 In Scandinavian style design, the kitchen island is minimal and simple, not only in its form and color, but also in the choice of materials. 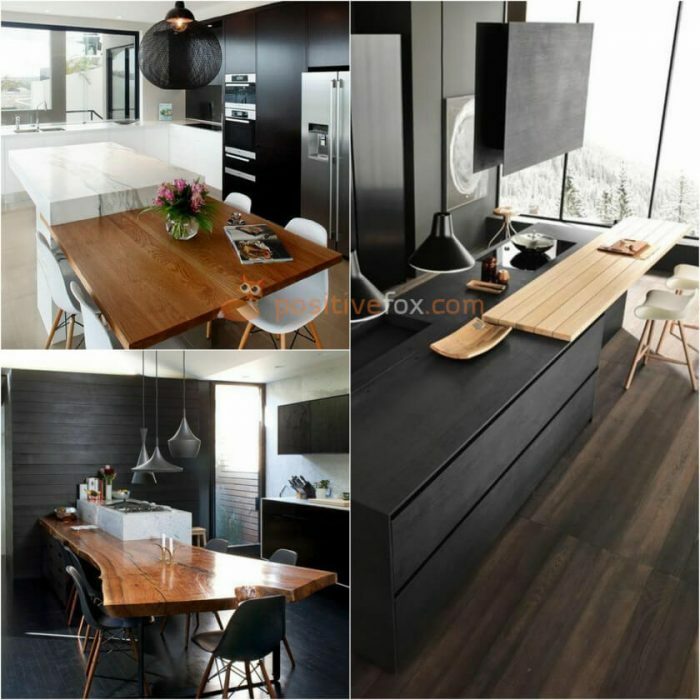 The tabletop should be made from solid wood, not stone. 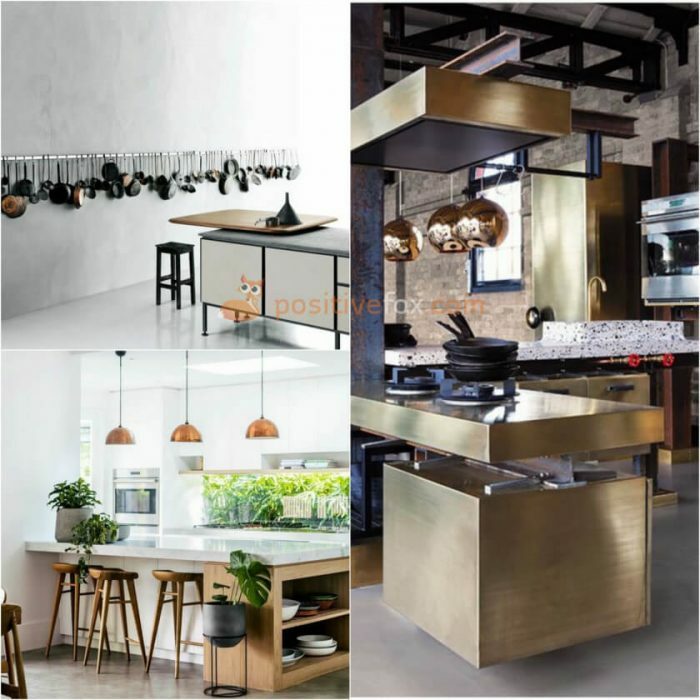 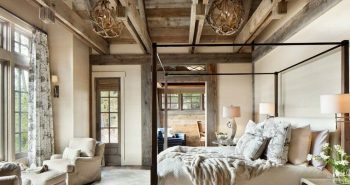 The frame can be made of metal, brick, wood, or even concrete. 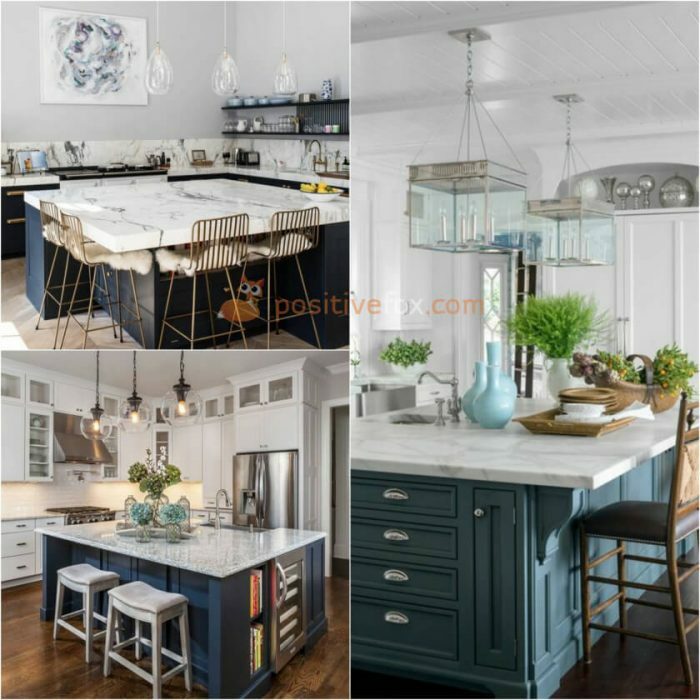 When it comes to an Art Nouveau style kitchen island, the preferred materials are metal with glass. 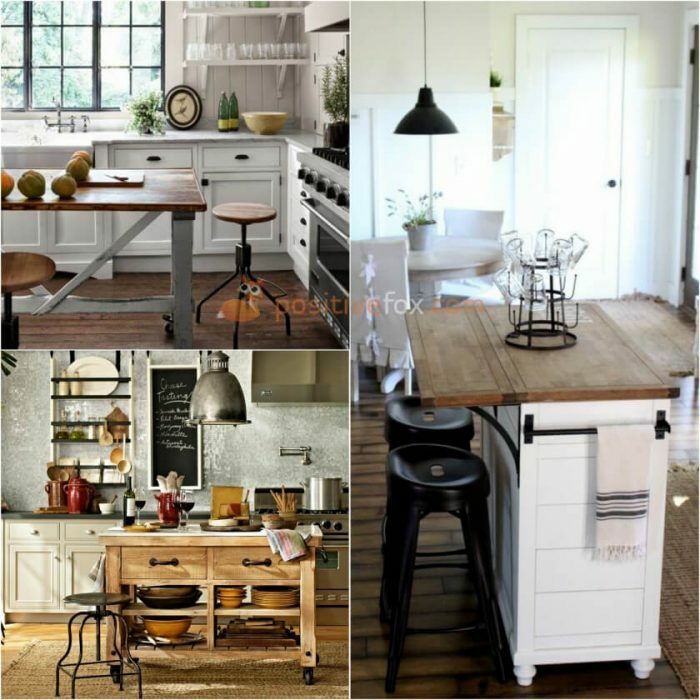 The worktop should be streamlined. 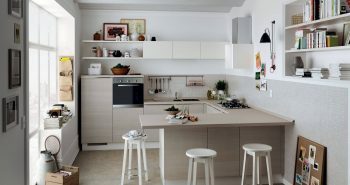 Any handles should be well hidden and all of the appliances need to be built-in. 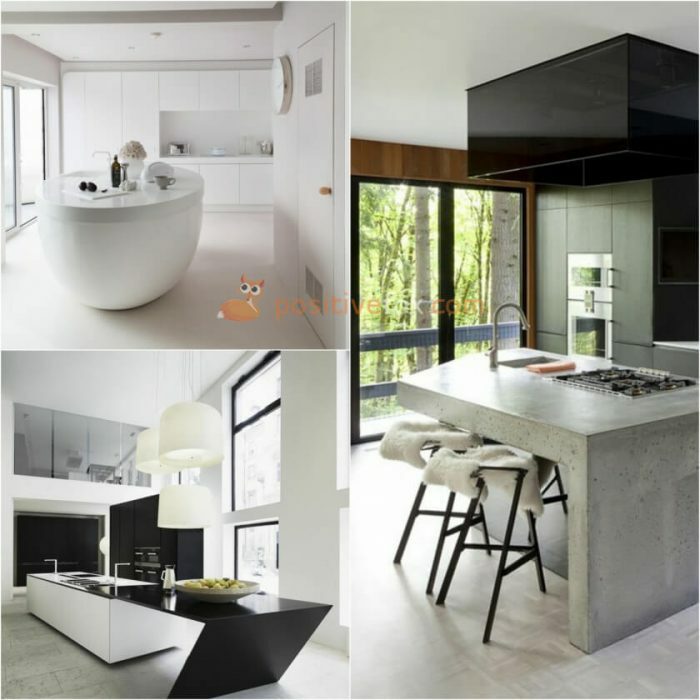 A high tech kitchen island should embody minimalism. 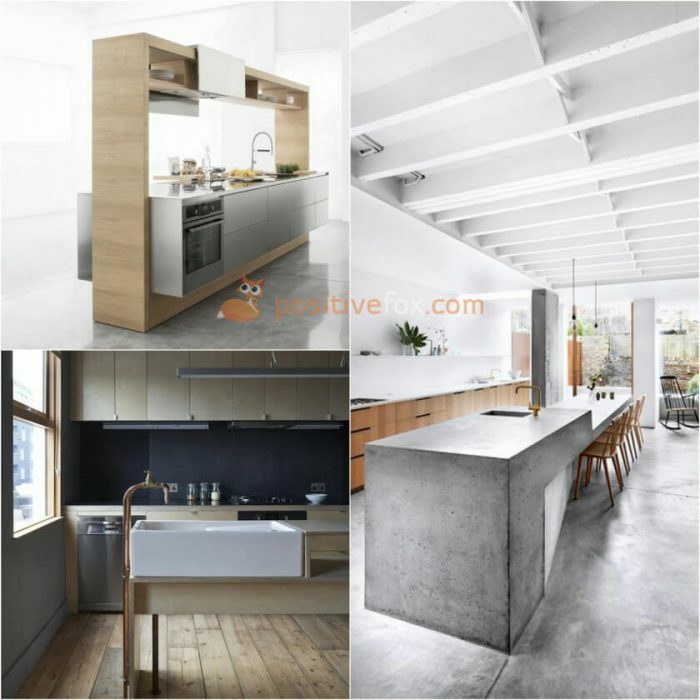 It can be set apart from other styles by its distinguished functionality and conciseness. 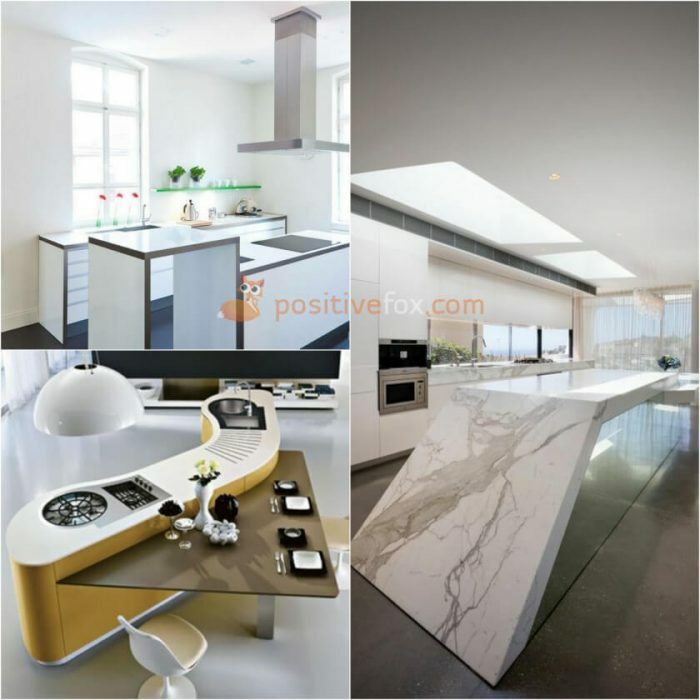 The countertop and kitchen island can both be made of glass, glossy stone or metal.